The region’s first affordable housing scheme built to Passivhaus standards was officially opened on 9th July at Callaughtons Ash, Much Wenlock. 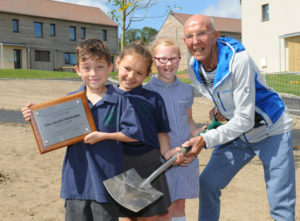 A tree was planted to celebrate the new affordable homes by local celebrity marathon runner Jimmy Moore, with the help of school children from Much Wenlock Primary School. house. 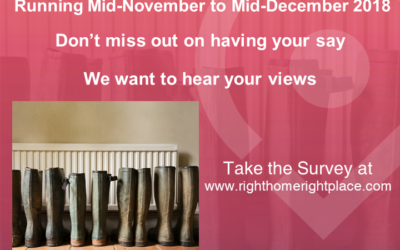 Although the cost of the build is 20% more than a normal new build home, South Shropshire Housing Association (SSHA) believe that this is the way forward for most affordable housing. 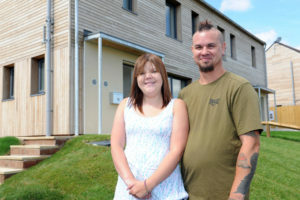 Amongst the specially invited guests were new tenants Jodie Rhodes and her partner Michael Doughty. Currently living in Broseley, Jodie has a long family history in Much Wenlock, with her eldest relative, her 100 year old great grandad who owned A R Wellings butchers located in Sheinton Street in the 1930’s. Most of Jodie’s extended family all still live within Much Wenlock and Jodie works in a local shop. The £2m build began in April 2017, with representatives sitting on a project board to help decide location, layout and type of construction. With the guidance of Shropshire Coulncil, SSHA’s community led building consultancy, Marches Community Land Trust Services (CLTs), and adhering to the Much Wenlock Community Plan, representatives learned about construction methods, decided on landscaping and visited the local timber frame manufacturer to see the house frames in construction. Jodie Rhodes with her partner Michael Doughty visiting their new home in Much Wenlock.frame manufacturer to see the house frames in construction. competition and making a visit to the site to learn about Passivhaus Principles. were so high that there were a total of 104 applications, with 27 of those satisfying the local connection criteria for this development. Christine Duggan, Director of Housing and Communities for Connexus, of which SSHA is a part, said, ‘We have worked hard to include the local community in the development of new affordable housing at Much Wenlock, and chose this site to test the Passivhaus principles of design and build. David Turner, Shropshire Councillor for the Much Wenlock Division, speaking about the Much Wenlock Neighbourhood Plan said, ‘A number of local people put many hours of work into the Plan.